With panoramic views of the Kerry countryside, feast your senses on the culinary delights at the hotel’s double AA Rosette restaurant, The Falls. Relaunched in early 2015 and now under the expert leadership of talented Head Chef Phillip Brazil, The Falls offers a fine dining experience in a relaxed and breath-taking environment. Chef Brazil serves modern Irish cooking with his own unique flair and the restaurant is open to non-residents as well as hotel residents. The restaurant uses the finest locally sourced fresh ingredients, and even smokes its own salmon in the hotel’s on-site smokehouse. The Falls offers a carefully curated menu with 2-course and 3-course options as well as a magnificent 7 Course Culinary Experience Tasting Menu, showcasing the breath of The Falls fine dining offering. Nestled on the outskirts of Kenmare in the heart of the Kerry countryside, the award-winning Sheen Falls Lodge offers a luxury 5 star getaway experience like no other. A warm and homely welcome awaits guests on arrival at the hotel, with a roaring log fire and an unforgettably relaxing ambience. Each of the hotel’s elegant and spacious rooms are carefully positioned so guests may delight in their majestic natural surroundings, with all rooms overlooking either the cascading Sheen Waterfall or the sweeping Kenmare Bay. With a breath taking 300-acre estate, Sheen Falls Lodge has a plethora of exciting outdoor activities to help guests make the most of their time in the Kerry countryside. From salmon fishing on a private stretch of the River Sheen to horse riding through the woodlands, embarking on an exhilarating Hawk Walk to strolling through the estate’s walking trails and paths, there is something for everyone to enjoy. Or if you simply fancy some rest and relaxation, guests can also visit the hotel’s sumptuous Easanna spa for a range of pampering treatments. To book an appointment, call a member of the spa team on +353 (0)64 6641600 or email healthclub@sheenfallslodge.ie. Boasting over 800 wine varieties from 18 countries around the world, the Wine Cellar at Sheen Falls Lodge is a sure delight for wine enthusiasts. The Wine Cellar is also available as a unique private venue, catering for 4 to 10 guests and offering an intimate and individualised experience at Sheen Falls. Soak up the picturesque surroundings of the hotel in this perfectly sunlit space while indulging in the hotel’s renowned 3-tier Afternoon Tea experience. 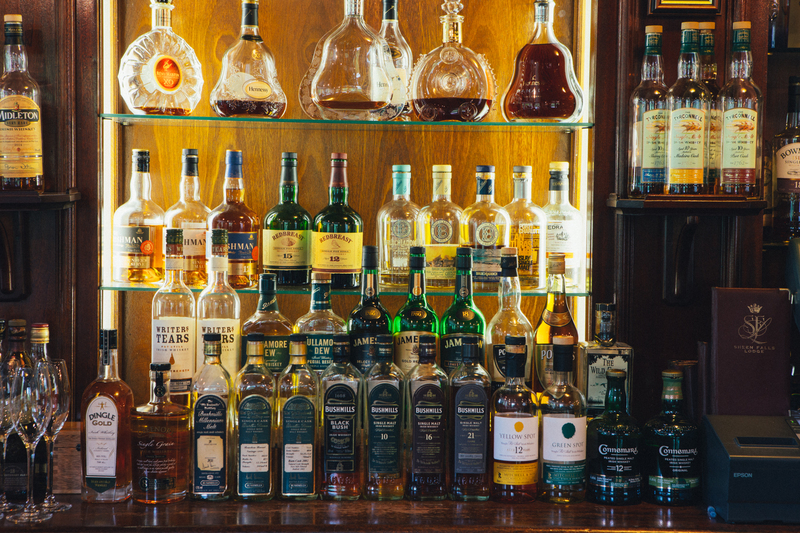 Relax, unwind and enjoy an unrivalled selection of whiskeys from all over the world in the hotel’s Cocktail Bar. The hotel’s talented mixologist will also be on hand to create a range of delicious cocktails, guaranteed to satisfy any taste buds. During the summer months, guests can also enjoy their tipple of choice on the outdoor terrace.